Well-crafted wayfinding systems encourage people walking and bicycling to go that extra mile, explore new areas, and foster a sense of place. Wayfinding systems should encourage increased rates of active transportation by creating a clear and attractive network that is easy to understand and navigate. Places that are arranged intuitively so that we can see obvious destinations from a distance, determine pathways, and recognize areas of different character are more legible. The “legibility” of a place describes how easy it is to understand. 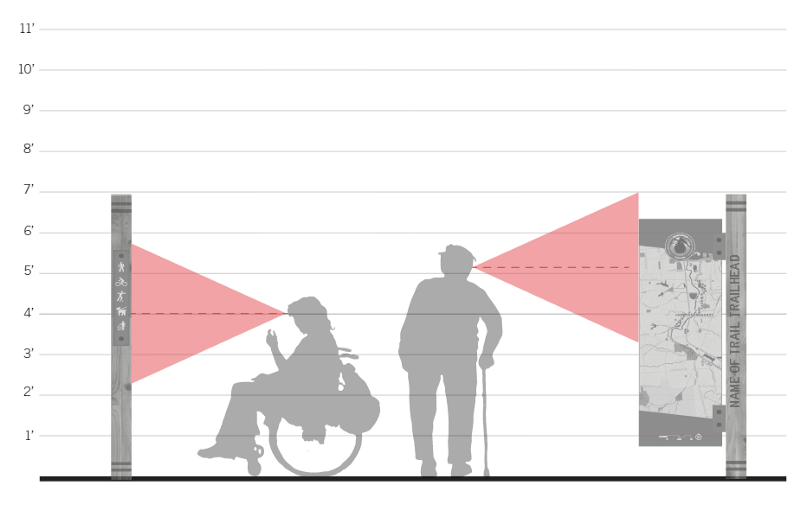 These six core principles aim to guide the placement and design of a wayfinding system in order to create a clear wayfinding experience and achieve a more navigable bicycle network. Effective wayfinding is an extension of the bicycling and walking network and provides a seamless travel experience for non-motorized users. Wayfinding signs typically only allow for a maximum of three destinations per sign. Therefore, there must be an approach for selecting and prioritizing the potential destinations to which bicyclists may want to travel. Level 1: Recognizable districts and neighborhoods. These may be city centers; historic, commercial, cultural, or educational districts; or neighborhoods with a distinct and recognizable name and character. Level 1 destinations should be included on signs up to 3–4 miles away. Level 2: Specific landmarks or major attractions which generate a high volume of visitors. Landmarks include transit stations, major tourist venues, regional parks, open spaces, and post-secondary educational institutions. Level 2 destinations should be signed up to 2 miles away. 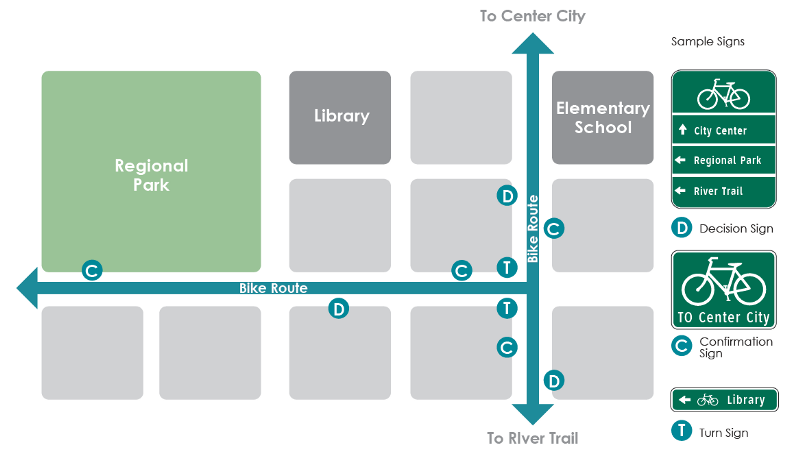 Level 3: Local destinations such as civic buildings, parks, high schools, shopping centers, and healthcare facilities. 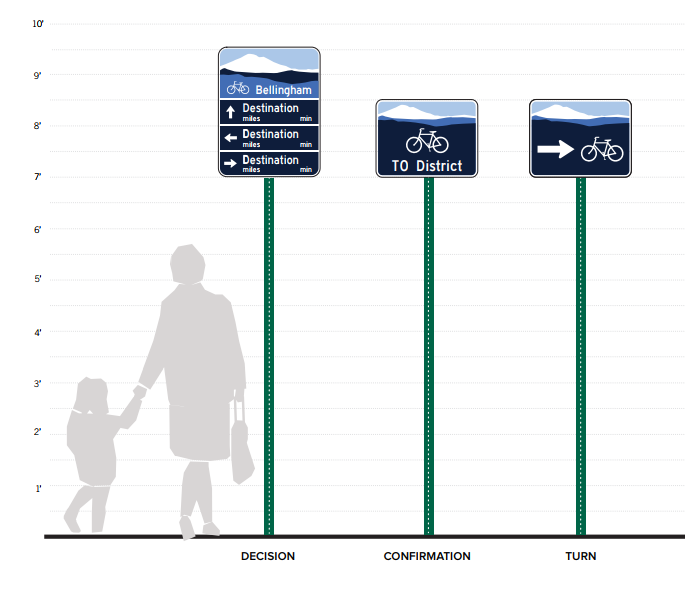 They typically occur on signs in low- density areas where few other destinations are present or along pathways not connecting higher priority (Level 1 and 2) destinations. Level 3 destinations may be signed up to 1 mile away. 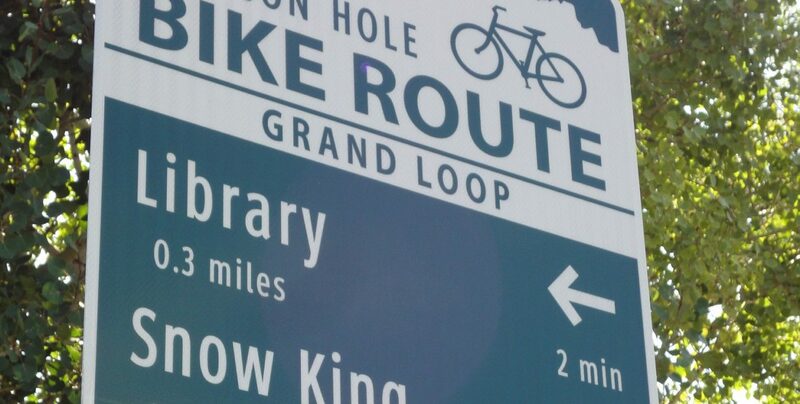 Connectivity also goes beyond physical signage — wayfinding signage elements can create a deeper connection to a place, cultivate a sense of pride by reflecting community values and identity, and support local economic development by encouraging residents and visitors to use services. 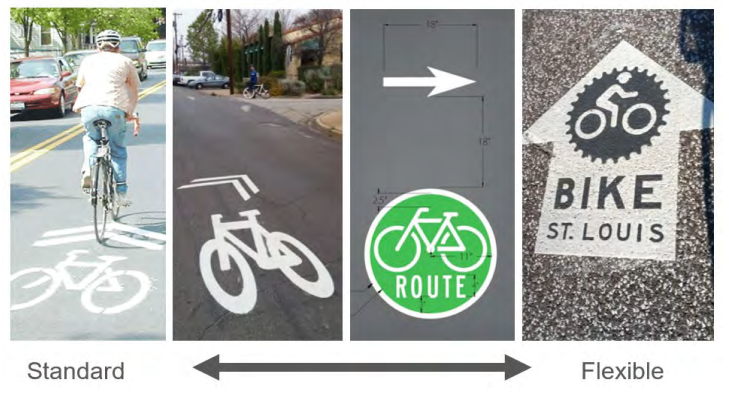 The presence of wayfinding signs should help to communicate that walking and bicycling to many destinations is possible, helping to reduce physical barriers to using these modes for all types of trips. An effective wayfinding system makes active transportation facilities more visible and helps to increase use of both on-street and off-street facilities. If existing facilities are underutilized, wayfinding improvements are a cost-effective way of increasing use. Wayfinding concept renderings for the City of Santa Clarita, CA. 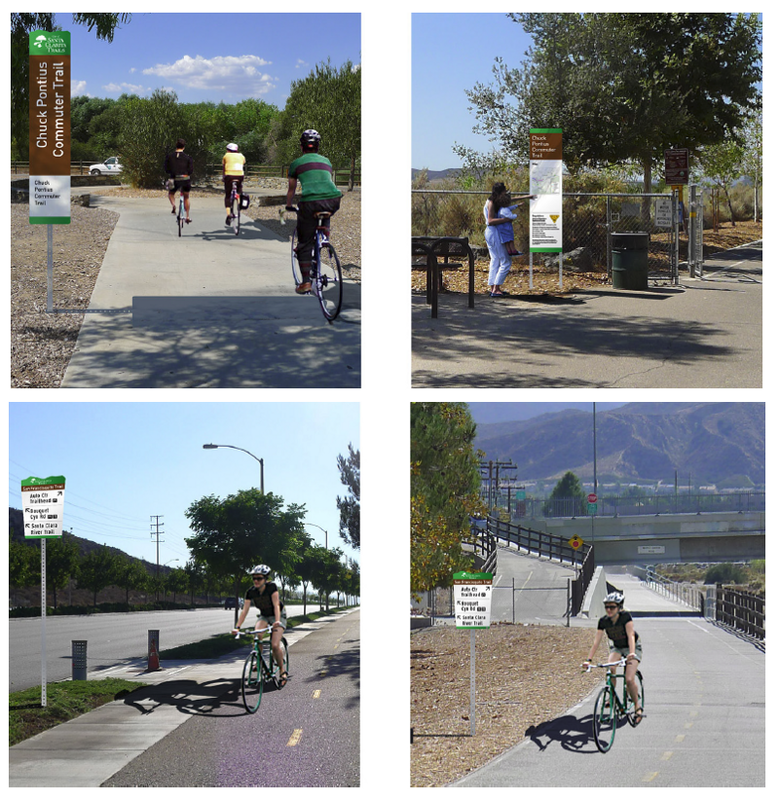 Alta developed a wayfinding program for the city’s extensive bicycle and pedestrian network, consisting of over 80 miles of trails, bike lanes, and paseos. Bicycling and walking require physical effort, and frequent stopping and starting to check directions may lead to frustration and discouragement. Consistent, clear, and visible wayfinding elements allow people walking and bicycling to navigate while maintaining their state of motion. To help users maintain motion, wayfinding information also needs to be presented so that it can be quickly read and easily comprehended. Effective wayfinding systems are predictable. When information is predictable, patterns emerge, and users of the network will be able to rely on the system to provide information when they expect it. Predictability also helps users to understand new situations quickly, whether it be navigating a new intersection or travelling to a destination for the first time. Typical placement scenario showing a decision sign located prior to an intersection of two facilities. Users come to trust a predictable wayfinding network, making new journeys easier to attempt and complete. Every time a new trip is completed, users’ confidence in the wayfinding network will be sustained or increased. Predictability should relate to all aspects of wayfinding placement and design (i.e., sign materials, dimensions, colors, forms, and placement). Similarly, maps should employ consistent symbology, fonts, colors, and style. The system should be designed in accordance with local, state, and federal guidelines, ensuring that it can be funded through state and federal sources. Wayfinding family from the Wichita Wayfinding System Plan. For a wayfinding network to be effective, information needs to be presented clearly and logically. It is important to provide information in manageable amounts. Too much information can be difficult to understand; too little and decision-making becomes impossible. The placement of signs and the information provided at each placement are also critical. To be successful, wayfinding information must be provided in advance of where major changes occur and confirmed when the maneuver is complete. 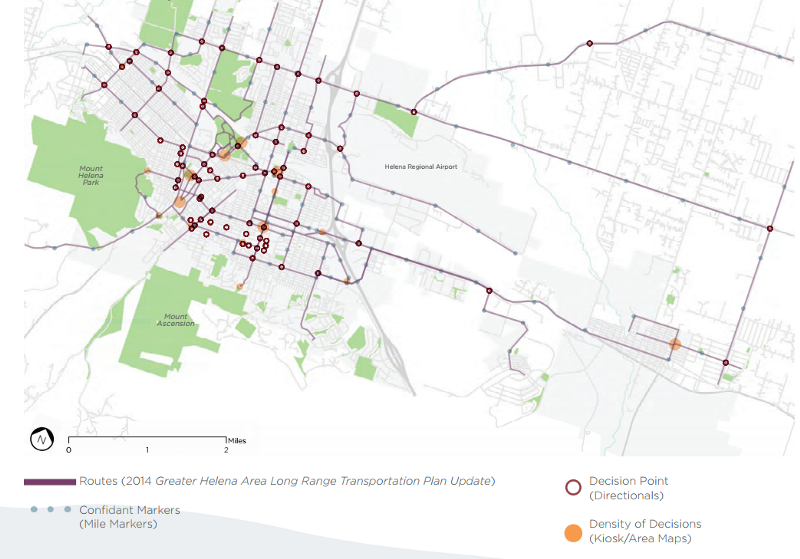 Planning level placement plan for the Helena, MT, Wayfinding System Plan, which illustrates locations for sign placement along priority routes, determined by data-driven and community input. Wayfinding signage should be accessible and be designed to be comprehensible by a wide range of users, including people of all ages and ability levels. As wayfinding systems often relate to accessible routes or pedestrian circulation, it is important to consider technical guidance from the Americans with Disabilities Act (ADA) to implement wayfinding signs and other elements that do not impede travel or create unsafe situations for pedestrians, bicyclists, and/or those with disabilities. The height of sign messages should reflect the of the height of the readers, and consider users of all abilities. Special consideration should be taken for those without high educational attainment, English language proficiency, or spatial reasoning skills. In areas with high rates of users with English as a second language, the wayfinding should use text and symbols that will be understood by non-English speakers. Designers should minimize the use of bilingual text or separate-language signs, as including these elements can make signs cluttered and reduce overall legibility. To craft a successful wayfinding system, the planning and design process can begin with these six principles to focus the intent of messaging and provide a framework for implementing a cohesive, easy to use network of routes and signs. Learn more about Alta’s wayfinding services.